Land Rover Australia have done a couple of quick public showings of a pre-production 2017 Land Rover Discovery over the past couple of weeks, giving us a hands-on opportunity to have a closer look at the 4WD wagon. 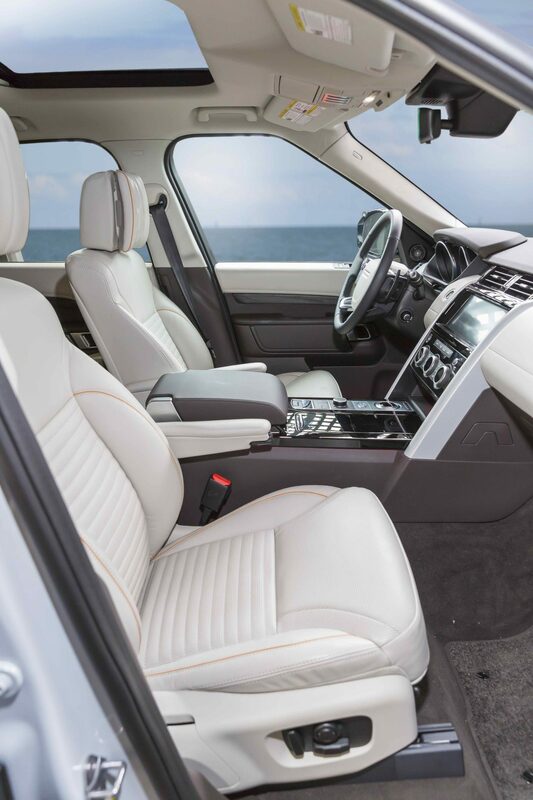 The 2017 Land Rover Discovery, with an obvious focus on keeping things clean and uncluttered. This has given us an opportunity to gather extra details, on top of the reveal pictures Land Rover released back in September. What we are looking at here is a pre-production model built to test the tooling and production line, and was apparently usurped by Land Rover Australia before making it’s way over to Toronto (Canada, not NSW Central Coast) for their Auto Show. So while many details can be gleaned from this, not everything is accurate. We understand prices on the 2017 Land Rover Discovery range from roughly $80,000, through to $130,000, depending on spec. In other words, there is roughly a $10,000 hike across the board, compared to the outgoing Discovery 4. There is a pretty big jump in technology in this model, with the fresh drivetrain options, a hugely lighter overall weight, and the impressive interior setup. How capable the new Discovery will be off-road remains to be seen, but we’re told that this model sports better wheel travel and ground clearance compared to the old model. 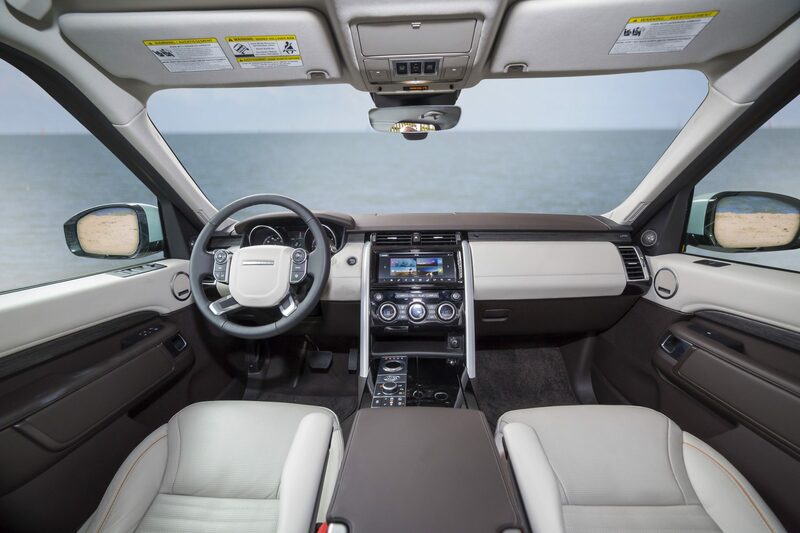 2017 Land Rover Discovery folding 2nd row seats, with electric control. One of the biggest changes is under the skin. Land Rover have managed to ditch just about all of the steel in this new 2017 Discovery, knocking a whopping 480kg off the vehicle’s weight. Almost a half-tonne, which will improve the vehicle’s steering, braking, fuel consumption and performance on and off-road. In terms of dimensions, the 2017 Land Rover Discovery is slightly shorter and wider than the outgoing Discovery 4. The body is a little longer, but storage space is slightly reduced. This is presumably because the interior design focuses on impressive passenger comfort and space, across all three rows. It’s pretty impressive. Where this model does make big strides is in the interior. Your 2nd and 3rd row of seats all move electrically, setting up for passengers or stowing down and flat for maximum storage space. This is controlled by buttons located throughout the cabin, or by an app on your phone, so you can do it remotely. The finish of the interior of the model we saw is really top-notch. The seat materials and finishes were quite resplendent, as well as the buttons, controls and other plastics. 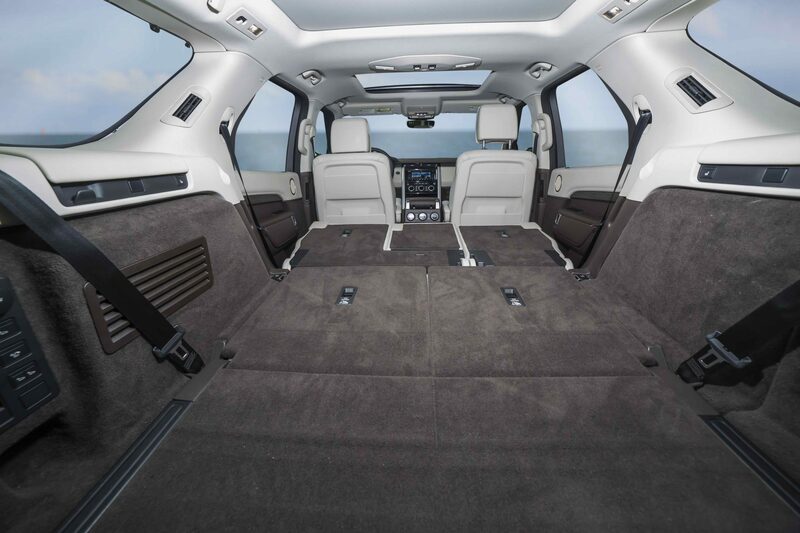 2017 Land Rover Discovery interior storage space, with 2nd and 3rd-row seats folded down. 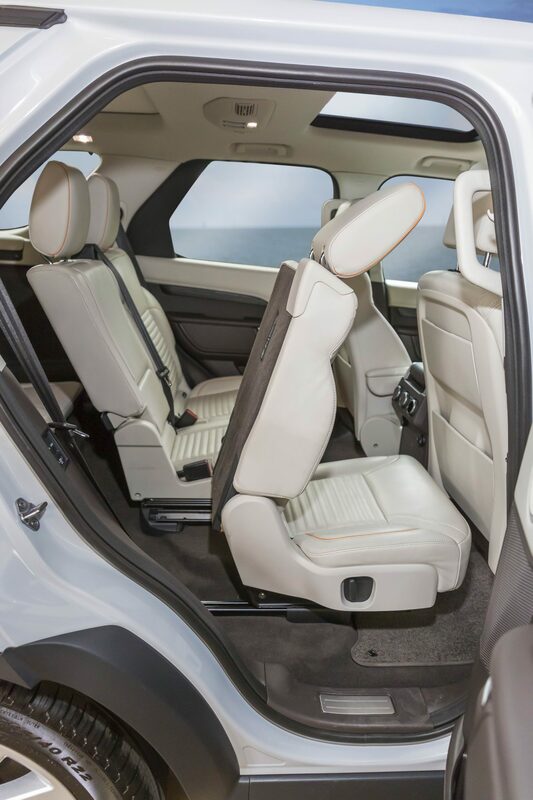 The all-new Discovery will have up to nine USB ports located throughout the cabin as well, along with lots of little nooks and hidey holes. Seats will have the ability to heat and cool (depending on spec, and what we get in Australia), but we’ll have to wait and see specifically what Australian-spec vehicles get. There will be three engines available with the 2017 Land Rover Discovery, all of them being diesel. A 132kW/430Nm ‘TD4’, a 177kW/500Nm ‘SD4’ (two turbos) and a 190kW/600Nm TD6. Like the outgoing Discovery 4, the 2017 Discovery (not a Discovery 5, mind you) will have airbags at all four corners and full-time 4WD. Off-road traction control is Land Rover’s very impressive ‘Terrain Response II’, tweaked to suit the 2017 Discovery. 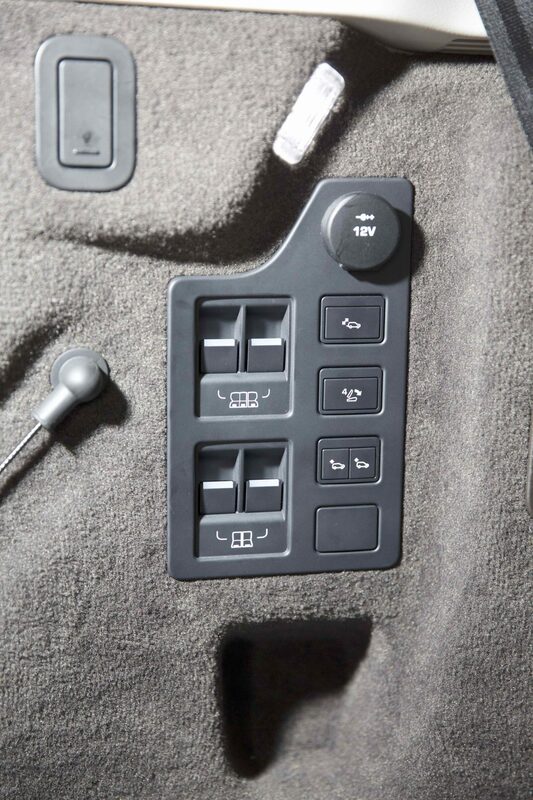 There’s also the ‘All Terrain Progress Control’, a form of cruise control for off-road driving. The interior is all about simplicity and elegance. There isn’t a multitude of buttons and switches, making you feel like you’re in command of the USS Gerald R. Ford. Instead, there is a basic layout of buttons, all painfully symmetrical and balanced… pragmatic, even. Land Rover have ditched the split rear door in the 2017 Discovery, instead opting for a one-piece flip-up door. There is still a little (electric, of course) bench that comes down, which is rated to 300kg. Perfect for sitting on and watching the polo, I suppose. You can also adjust the height of the rear suspension as well, filling or emptying airbags with the press of a button. I think that’s really awesome. Airbag suspension means you have an adjustable ride height on the 2017 Land Rover Discovery. Maximum ground clearance is listed at a hefty 283mm with the suspension at it’s highest setting, which is available under 50km/h. At this same height, wading depth is listed to be 900mm. There is where you control all of the electric interior seats and doors, in the boot. The 2017 Land Rover Discovery is certainly more evolution that revolution for the Land Rover range and Discovery nameplate. 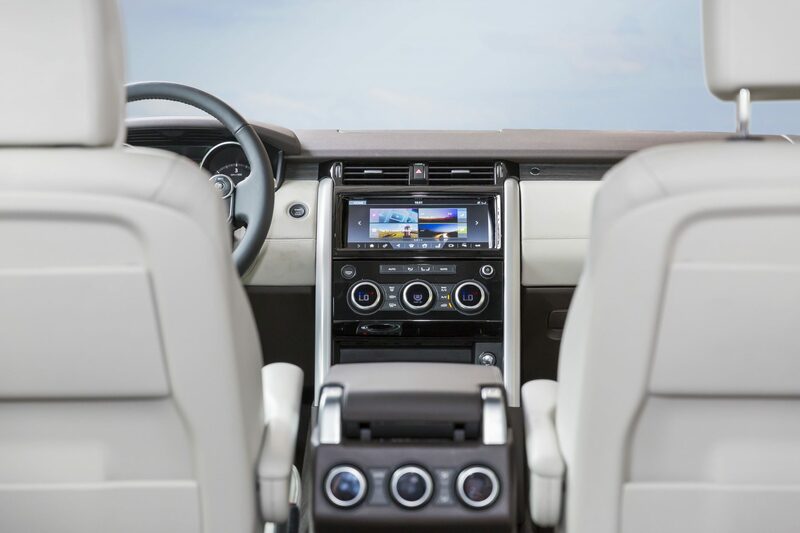 The overall look and feel, inside and out is one that is instantly familiar to the rest of the Land Rover range. Aside from the new aluminium frame and bodywork, which brings it in-line with the Range Rover and Range Rover Sport there is no new technology that is pioneering on this model, rather a combination of existing technologies and designs into a new-look platform. 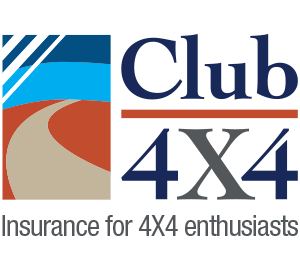 This article was originally posted by Mr4x4. The suspension will now stay in high-mode at speeds of up to 80 km/h, so . big improvement over the D3/4.